The recently opened Bunkermuseum in Hamburg is a well restored Air-raid Shelter-Bunker from WW2. Most WW2 air-raid shelters in Hamburg have long since filled with rain water but in this new Museum, for a DM5 entrance fee, one is carefully permitted to negotiate the steep stairs down into the murky past. Three long tunnels are on display, each capable of holding 50-60 people, but, we were told, "As the war progressed often more than 200 people were crammed into each tunnel" . On reaching the bottom of the stairs, some 10 meters underground, the first sign that caught my eye, written in large letters in front of each tunnel -- it was THAT word again -- "GASSCHLEUSE". [Gas tract]. I asked the lady guide what it meant....she told me....."We were expecting gas attacks from the Allies. Every Air-Raid Bunker had a gas tract, and all the doors had peepholes in them so that the people inside could look out to see if it was safe to leave the Bunker...It was forbidden for people to stand in the Gas-Tract, but as the war progressed and the Bunkers filled up, there was no other shelter available". Every Bomb shelter had a Gasschleuse and peephole in the door.......Why should the Germans build Shelter-Bunkers outside of Germany (e.g. : Poland) any differently? Note: The theory that many of the features of the so-called "gas chambers" are in fact typical of gas-proof air-raid shelters, incorporated into all German public buildings and even private homes during WWII, has been developed in great detail and with great technical expertise by Samuel Crowell (see http://www.codoh.com/). formerly translated"Gasschleuse" as "air lock", i.e, the sign refers to a gas-tight security door, such as are alleged to constitute "proof" of "mass gassings" (the term is now missing). What is laughable is that most of the doors produced as "proof" of German "mass gassings" are not even gas-tight. Gas-tight doors did exist, but their purpose was to prevent German civilians, and other persons, from being "gassed" by the British. Churchill's drunken ravings even included a plan to contaminate German soil with anthrax. This was prevented only by German surrender. David Irving even believes that the British invented the "gas chamber" lie in the first place. According to Robert Faurisson and Mark Weber, the first "gas chamber" accusation actually dates back to March 22, 1916, and appeared in the Daily Telegraph (which has been under Jewish ownership since the 19th century): the Austrians and Bulgarians were accused of gassing 700,000 Serbs. Weber says: "The same periodical was the first daily newspaper to report (on June 25, 1942) the similar story of German 'gassings' during the Second World War". The Italian Government has today published the testimony of two Italian prisoners who escaped from Austria through Serbia, and took refuge in Rumania. What these two prisoners saw and learned, however, was nothing compared with the evidence supplied by the Serbians themselves, and communicated by M. Pasitch to the Italian Government and to the Pope. 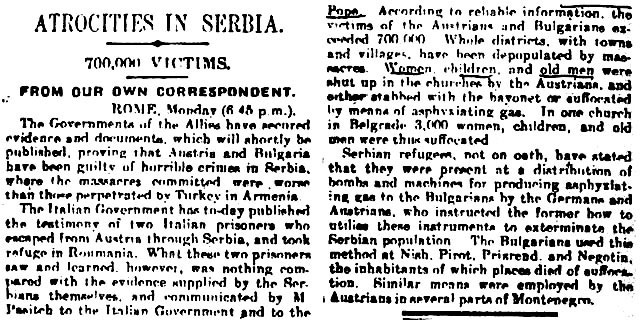 According to reliable information, the victims of the Austrians and Bulgarians exceeded 700,000. Whole districts, with towns and villages, have been depopulated by massacres. Women, children and old men were shut up in the churches by the Austrians, and either stabbed with the bayonet or suffocated by means of asphyxiating gas. In one church in Belgrade, 3,000 women, children and old men were thus suffocated. Serbian refugees, not on oath, have stated that they were present at a distribution of bombs and machines for producing asphyxiating gas to the Bulgarians by the Germans and Austrians, who instructed the former how to utilize these instruments to exterminate the Serbian population. The Bulgarians used this method at Nish, Pirot, Prisread and Negotin, the inhabitants of which places died of suffocation. Similar means were employed by the Austrians in several parts of Montenegro." Note that there is an apparent shortage of technical detail, as with the "gas chambers" of today. See also FALSEHOOD IN WARTIME, by Arthur Ponsonby. On anthrax as an intended WWII British "weapon of war", see DEALY ALLIES, by John Bryant.